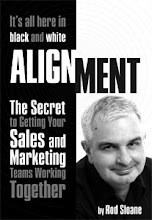 Sales and Marketing Alignment Blog from Rod Sloane: Stop being such a Namby-Pamby in your Marketing! This week I have been facilitating a How to Write Your Marketing Plan less than 3 Hours workshop. What can you say that might raise the curiosity and cause the reader or prospect to stop and take a lot at what you have to offer? Don’t worry this is what those big corporates pay lots of dosh to swanky agencies for. So how can you do without paying a Berkeley Square fee? Ask yourself this question “What can you say that either you competitors can’t or won’t say?” Go on I encourage you to go for it. Stop using those namby-pamby cliché ridden terms and say what you want to say. I don’t offer practical marketing. What can you say that either you competitors can’t or won’t say?